Times Square in Manhattan, New York is one of the iconic scenes of the sleepless city, filled with glamorous advertisements that draw 20 million tourists every year. A similar sight is about to unfold in the center of Korea’s capital city of Seoul, with the COEX (convention, exhibition, and shopping complex) and World Trade Center area in the city’s business district of Gangnam-gu, designated as Korea’s first free outdoor advertisement zone. 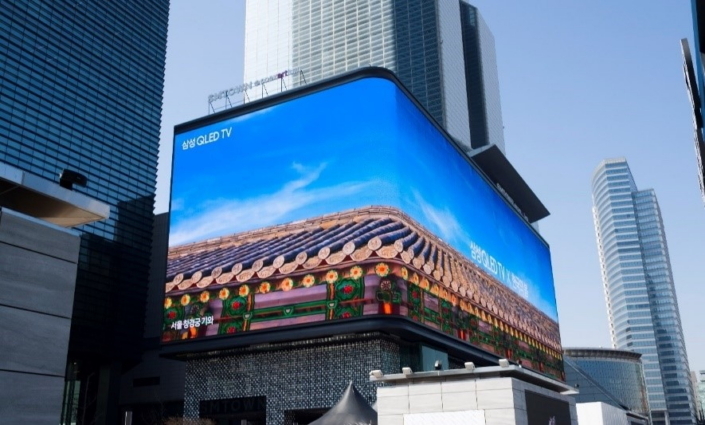 For its part, Samsung Electronics installed the largest ‘SMART LED Signage’ in Korea on the outer wall of the SM Town and K-Pop square of COEX. Let’s take a closer look. 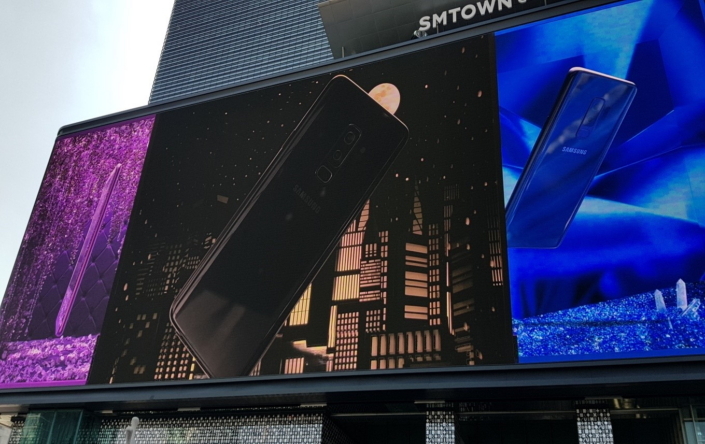 The LED Signage on the outer wall of COEX SM Town took seven months to install, from September 2017 to March 2018. The Signage is four times the size of a basketball court with a total surface area of 1620m². This was made possible by connecting two LED displays together by a curved edge. The scale of the curved display is truly breathtaking when seen upfront, with the screen demonstrating vivid color representation and clarity even in the brightest sunlight. Sungwook Yoon, with Samsung Electronics’ Building Solution Group, led the installation, and made the bold decision to apply a curved design to the signage. It is the first case in Korea of a signage display that utilizes two sides of an outdoor advertisement area. “Signage for advertisement purposes is mostly flat or uses only one side of a space, like a rooftop electronic display,” said Yoon. “This new display can be used to show one content item, or separately to show different content. This flexibility of use enables more effective ways to deliver immersive content.” Specifically, when two sides of two displays meet in a perpendicular configuration, the content is likely to be distorted. But, if the two displays are connected by the curved display, content can be represented without any distortion. This is a key strength of Samsung’s new SMART LED Signage. In terms of brightness, the team sought to realize the best quality in the industry. “While displays for residential use typically feature 300 to 500nit brightness, the SMART LED Signage uses up to 9,000nit so that it can show clear images even with bright sunlight,” said Park Jung-bum of Samsung’s B2B Group. The Samsung SMART LED Signage also automatically adjusts its brightness. Too much brightness can make drivers or pedestrians uncomfortable, so the SMART LED Signage lowers or increases its brightness according to the movement of the sun. Jinwook Kim of Building Solution Group said, “The SMART LED Signage is made of around 31,000 LED display modules. The distance between each pixel is 10mm to show a clear and vivid image from all directions.” This is prime example of Samsung’s detail-oriented effort, considering that the typical size of the gap between each pixel in outdoor advertisements in Korea is 16-20mm. The SMART LED Signage not only displays the same content in more detail, but also provides water and dustproof features, as well as up to 100,000 hours of use, for optimal reliability and functionality. Samsung SMART LED Signage supports resolution of 7,840 X 1,952 pixel, which is almost twice the resolution of UHD. With a high refresh rate of 49,920Hz, it depicts smooth and uniform images without distortion. The high resolution and clear content representation is perfect for displaying 3D advertisements, for example K-Pop performances, and is soon to become a unique landmark of Korea. 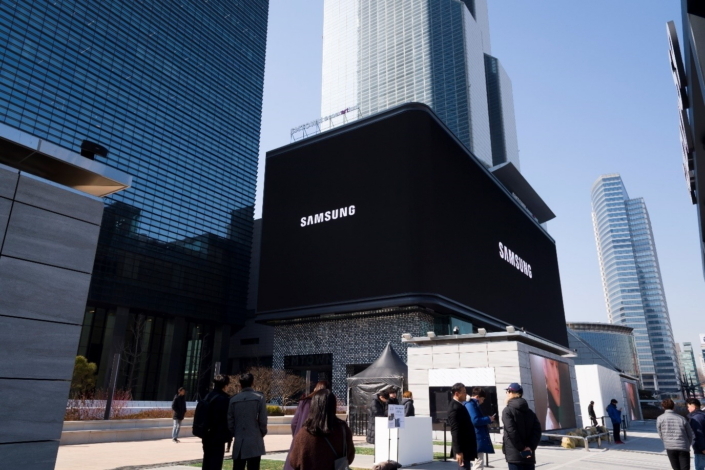 Starting with COEX SM Town, Samsung Electronics will continue its involvement in Korea’s free outdoor advertisement zone project with its SMART LED Signage for the next ten years. The project aims to help raise the brand value of Seoul through development and promotion of the city as a ‘global digital media landmark.’ The SMART LED Signage will help bolster the local economy and help the city gain competitiveness with an exciting new tourist attraction as its next landmark.